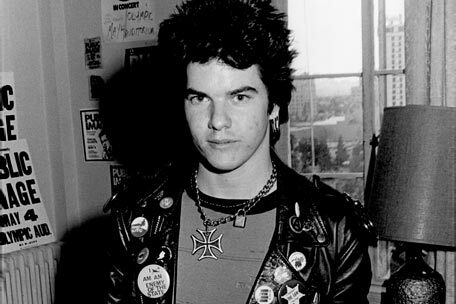 Born Jan Paul Beahm on 26 September 1958, Darby Crash had a bad start in life. When he was young, his older brother died of a drug overdose, and he spent a large part of his life believing his father had left them. He found out in his teens that his father was really a Swedish sailor. Crash lived with his mother most of his life. Accounts of this time of his life show that his mother was possibly mentally ill, often verbally abusing Crash. In his school years, he attended a program call Innovative Program School (IPS), where students were allowed to form their own classes. He and his bestfriend, Pat Smear (born Georg Ruthenberg) formed a class for themselves call “Fruit Eating” where they would go to the market, eat fruit for an hour, then return to the school. Over time, the two became frequent users of LSD, and soon had a following of students who would also use the drug. The two were accused of brainwashing students, so they were dismissed from the school in 1976. Shortly afterward, the two tried forming their own band. They originally wished to call it “Sophistifuck and the Revlon Spam Queens”, but they couldn’t afford to have the full name printed on a shirt, so they settled for calling themselves the much shorter name of The Germs. At the time, only Smear was good at an instrument. The band can be seen in the 1981 film, “The Decline of Western Civilization“. They quickly became known around Los Angeles for their chaotic shows. Onstage they had a ritual called a “Germs burn.” Crash would put out a cigarette on some lucky fan’s arm, scaring them with the mark of his band. The Germs split up in 1979, and soon after Crash moved to England, where he began using heroin. But he moved back to America, where he formed the unsuccessful Darby Crash Band. Shortly afterward, his new band split up, and he fell into a depression. He decided that the only way he would become a rock legend now was to commit suicide, which he did. Darby Crash committed suicide on 7 December 1980. The very next day, former Beatle John Lennon was assassinated, which took up the headlines that Crash’s death would have occupied, so it went largely unnoticed. Pat Smear later went on to play guitar in the band Nirvana, whose lead singer, Kurt Cobain, also committed suicide. He currently play guitar for the band Foo Fighters. In 2007, a biopic about Crash’s life was made titled What We Do Is Secret. This entry was posted in Blogthoven and tagged Crash, Darby, Germs, Nirvana, Pat, Smear. Bookmark the permalink.